We review Smash Up for iPad and iPhone. 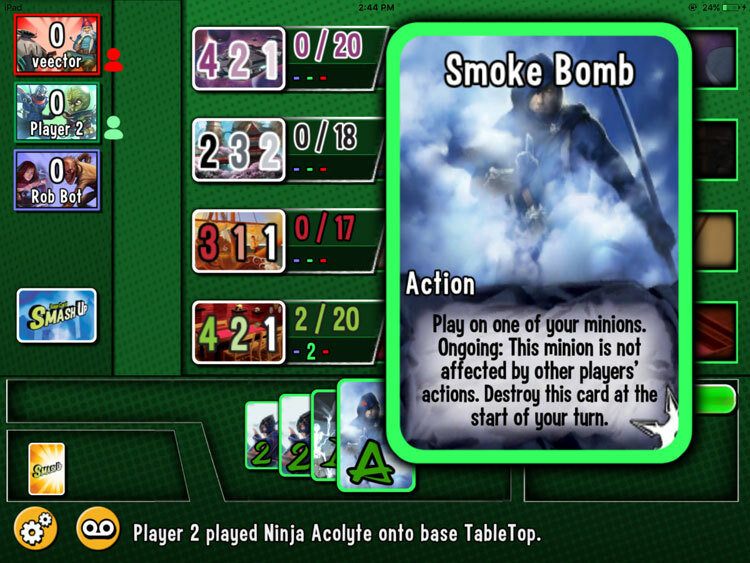 Smash Up is a crazy card game of combining zombies, aliens, robots and other crazy genres to battle of over bases. We dive into the app and see how it translates to the digital realm. There are a couple of primary axioms that strongly illustrate the reasons people will buy or switch to an iOS version of a game. The first is convenience. Getting players together for a physical game takes coordination to get people together and then manipulation of game components. The second is cost. A five dollar app makes more sense as a purchase for an unknown game. However, as helpful as these are to lure players to iOS games, they still might not be a substitute for the real game. Smash Up, a game that has bred expansions like rabbits in heat has made it to iOS. In this review, we’ll see if the virtual smashing is as smashing as the physical smashing, up that is. Smash Up is an area control card game for 2-4 players. It plays best with 3 or 4 players while taking 45 minutes to an hour to play. 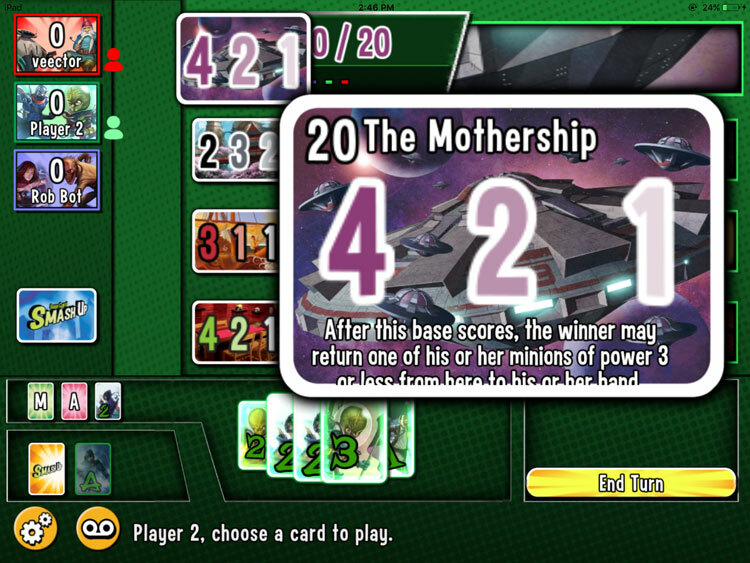 The gameplay contained in Smash Up relies on a multitude of half-decks of cards, each with a theme (pirates, aliens, zombies, wizards, etc…).Each player makes a deck of cards from two different themes. The goal is for a player to take control of bases, which are worth a varying number of points, and the player with the most strength at the base when the threshold is reached, wins it. On a turn, a player can play 1 minion card to a base and 1 action card. Usually, players are trying to play cards with abilities to give them higher strength, play more minions, or disrupt other players. Once a player manages to get 15 points from winning bases, the game is over and highest points wins. 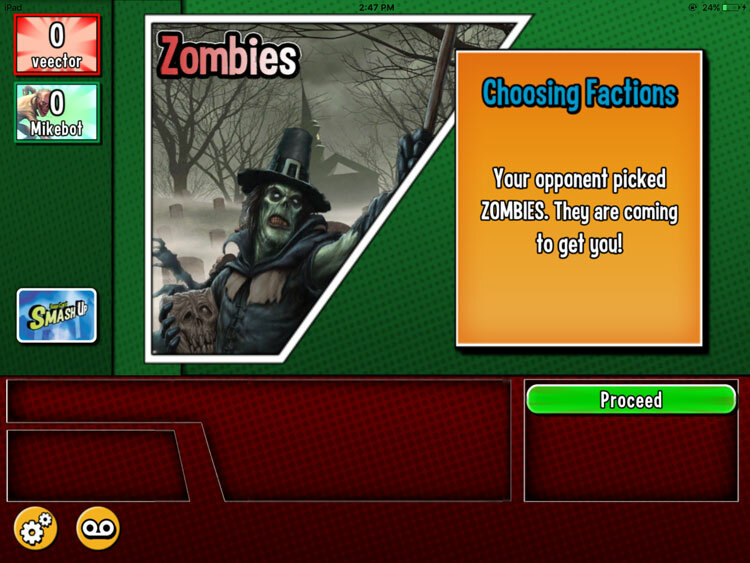 When choosing factions, there’s some standard art from the game to identify each faction. Obviously, the physical game requires lots of manipulation of cards. There is a lot of information to consume on the cards to understand their abilities and how they can combo with other cards. The main way players can access this information on their iPads (not advisable on any small screen) is by slowly dragging their finger through the cards in hand on the screen. In addition, players who need access to information about cards at a base will need to tap on the card. The miniature versions of the cards show the strength, but there’s potential for interaction with other minions after a new minion arrives at the base. This results in a lot of tapping to gain the necessary information. Other screen elements are appreciably convenient, including the strength totals for each base and their points awarded. Besides these, the screen design is flat, with little dynamism. The interface art style alludes to comic book art but doesn’t have any of the gravity or engagement. It’s there just to deliver information. Moving a finger over a card zooms it larger on the screen. Smash Up is a divisive game. There are some people who hate it and some people who find it enormously fun. The app here isn’t going to change any opinions. By and large, this is a by the book digital translation. The biggest frustration is the small footprint of the cards leading inadvertent card selection and lots of haptic interaction with the screen elements. There just isn’t enough physical space between the cards. Even for players with smaller fingers, this appeared to be an issue. It understandable when this is a game with lots of cards, but it’s still not forgivable. A base card lists 3 point values for first, second, and third place on in strength points of minions at the base when it scores. The second biggest complaint arrives after playing a few times. It’s something that, when players think about it, really seems terrible. There is no card reference guide or list of available faction decks and how they work. 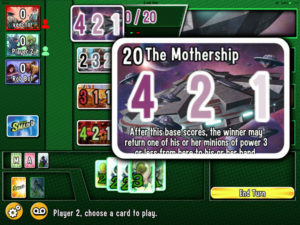 Each half-deck’s theme builds upon some core mechanisms, nowhere in the app is there a list of these (besides deck selection when starting a game) nor is there a list of card abilities to think about combinations to be made pre-game. The one positive to be said is something only the die-hard fanatics will appreciate. The AI is good, really good. It also tends to select just the right kind of combinations of decks to make good cards work better. Players unfamiliar with these good combos will be surprised at a quick beat down. The lackluster package is rounded out with one final complaint: Smash Up was intended to be played in person. It’s inconceivable to this reviewer how Smash Up can be enjoyable without table talk or staring down another player as you ready a mutant T-Rex to join a Zombie Lord at a Base. That’s just the kind of game this is and getting all of that to translate to a remotely played experience seems unattainable. There’s one pleasant thought that resonates with this reviewer, “I’m glad that’s over.” Reviewing games, you always hope that some aspect of a new game will be really well done, or there will be a cool idea that jumps out from the crowd. Smash Up offers none of that. It offers exactly what the physical card game offers with none of the energetic banter or beer and pretzels energy of an in-person game night. That fun is a big reason why people play and a straight-laced digital translation of Smash Up just doesn’t have the same power to captivate. Final Score: 2.5 Stars – Smash Up on iOS feels like an obligatory offering, but the ultimate package bogs it down and does not help bring the light-hearted fun.